The Abarth 2400 coupé, designed by Michelotti, was presented at the Geneva Motor Show in 1959. It was a Gran Turismo version of the Fiat 2100, built at the Allemano carriage works from 1962 to 1964, known first as the 2200 coupé and, in the last year - when it was built on the Fiat 2300 base - as the 2400 coupé. The A112 Abarth, is a sporty version of the A112 developed in association with the Scorpion Brand, with boosted displacement, power and torque. Naturally, the performance was also upgraded: the A112 Abarth could do more than 150 km/h and accelerated from 0 to 100 km/h in little more than 12 seconds. 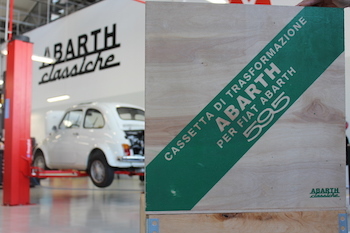 The components that make up the "Abarth Classiche 595 Conversion Kit" are presented in a special wooden box, reproduced with markings inspired by the original and with the Abarth Classiche seal to denote a product designed and built in accordance with the Scorpion Brand's racing tradition. This year's classic re-enactment of the legendary "Targa Florio", the oldest motorsports race in the world, now at its 102nd edition, which starts today, is being sponsored by Abarth. Three cars from the FCA Heritage collection: an Abarth 2400 coupé (1964), a Fiat 500 (1974) which has been upgraded with the new "Abarth Classiche 595 Conversion Kit" and and Autobianchi A112 Abarth 58 HP (1974) will take part in the “Targa Florio Classic”. The "Targa Florio Classic", the regularity competition for historic cars, organised by ACI Storico will be held in Sicily from today to Sunday (4-7 October). Following scrutineering yesterday, the action officially gets underway at 1830 this evening in the Piazza Verdi with the starting ceremony. Originally conceived, funded and organised by Palermo magnate Vincenzo Florio for the purpose of establishing a "practical and precise criterion for assessing the travelling car", the race has been run, in various forms, ever since 1906. Now organised by the Palermo Automobile Club in association with Automobile Club d'Italia, this year the event is also supported, in the role of main sponsor, by the Abarth brand, which has a long bond with this race. FCA Heritage, the Group department dedicated to safeguarding and promoting the historic legacy of FCA's Italian brands, has selected three Abarth cars from its collection to compete in the Targa Florio Classic: an Abarth 2400 coupé from 1964, an Autobianchi A112 Abarth 58 HP from 1974 and a Fiat 500, also from 1974 which has been upgraded with the new "Abarth Classiche 595 Conversion Kit". They each represent one of the three "categories" of the Scorpion’s output of road cars: the 2400 with Allemano bodywork is a good example of Abarth's ability as an independent constructor of high-end GT cars, while the A112 recalls Abarth's entry into the Fiat Racing Department following its 1971 acquisition. Lastly, the 500, upgraded with the new 595 transformation kit produced by FCA Heritage, remembers the years when Abarth created its famous tuned-up versions of small-displacement Fiat cars. What's more, to celebrate the 110th anniversary of the birth of Karl Abarth (Vienna, 15 November 1908 - 23 October 1979), the Sicilian event will enjoy the presence of two figures of symbolic importance for the brand: Anneliese Abarth, who will take part in the starting parade in the 2400 Coupé once owned by her husband, and Eris Tondelli, historic Abarth racing and test driver, who worked on the development of the 595 cars in the Sixties, and will be participating at the wheel of the Fiat 500 upgraded with the replica conversion kit. Finally, the Abarth brand's current production car range will be on display in piazza Verdi in Palermo over the course of this weekend, while some of the Scorpion models will also be available for test-drive in the city's famous Mondello district. This coupé, designed by Michelotti, was presented at the Geneva Motor Show in 1959. 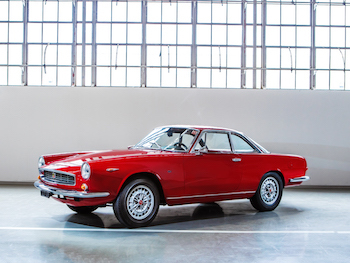 It was a Gran Turismo version of the Fiat 2100, built at the Allemano carriage works from 1962 to 1964, known first as the 2200 coupé and, in the last year - when it was built on the Fiat 2300 base - as the 2400 coupé. The straight 6-cylinder engine of the 2400, generating 140 HP, powered the model to a top speed of 200 km/h. This particular car belonged to Karl Abarth himself. Launched at the Turin Motor Show in October 1969, the Autobianchi A112 was an attractive runabout, ideal for city use thanks to its compact size. The mechanical layout was highly original: the engine, derived from the 4-cylinder overhead valve unit of the Fiat 850, was mounted transversely at the front, while the car featured front-wheel drive and independent wheel suspension. 1971 saw the debut of the A112 Abarth, the sporty version developed in association with the Scorpion Brand, with boosted displacement, power and torque. Naturally, the performance was also upgraded: the A112 Abarth could do more than 150 km/h and accelerated from 0 to 100 km/h in little more than 12 seconds. The car's looks were also modified to give it sportier connotations: inside, the instrumentation was expanded to include rev-counter, ammeter, pressure gauge and oil temperature gauge. The seats were supportive and the steering wheel was in aluminium, with three spokes. Recently purchased by FCA Heritage, the car taking part in the Targa Florio Classica is from the second series. The conversion kit is a replica of the one which shaped Abarth's history by establishing it as the brand which invented the upgrading and tuning of mass market cars. In detail, the new kit comprises cylinder liners and pistons with diameter 73.5 mm, set of valve springs, camshaft, cylinder head gasket, oil sump, Weber 28 carburettor, and complete exhaust with the relative mounting brackets. All components are presented in a special wooden box, reproduced with markings inspired by the original and with the Abarth Classiche seal to denote a product designed and built in accordance with the Scorpion Brand's racing tradition. Abarth has enjoyed plenty of success in the past on the Targa Florio, including many class wins, especially with the Abarth 1000 SP cars, which proved suited to the Madonìe roads’ and also enabled many gentlemen drivers to achieve impressive results in the overall competition. The victories of the Abarth 124 Rally models in the last Seventies editions were also memorable. Since the Targa Florio was transformed from a race to a rally in 1978, Abarth has recorded several overall victories: two with the Abarth 131 Rally, in 1979 with Adartico Vudafieri and in 1980 with Mario Pasetti, and two in 2003 and 2004 with the Fiat Punto Super 1600, driven in both cases by Paolo Andreucci, who also won in 2006 in the Abarth Grande Punto S2000. The same model was first to pass the finish line in 2009 with Luca Rossetti at the wheel. Abarth can also lay claim to the 9 overall first places won by the Lancia Rally, Lancia Delta S4 and Integrale, all cars developed by Abarth engineers. 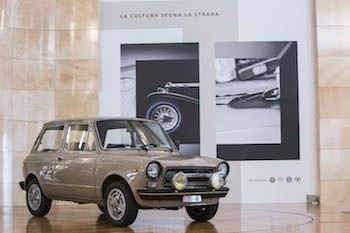 Last but not least, in the two latest editions of the Targa Florio all the thrills of the past have been brought back to life by the contemporary Abarth 124 Rally.